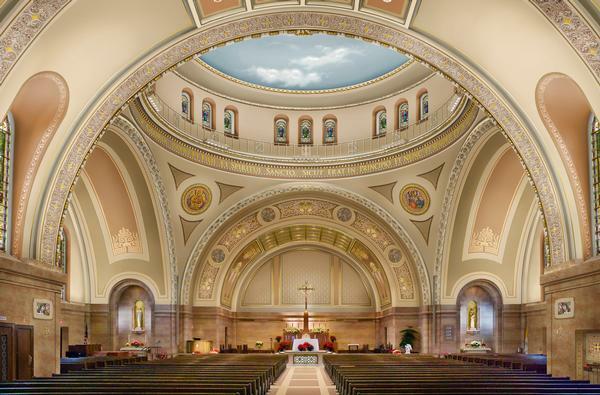 In 2014, Conrad Schmitt Studios completed an interior decorative project for St. Charles Borromeo Catholic Church in St. Anthony, Minnesota. 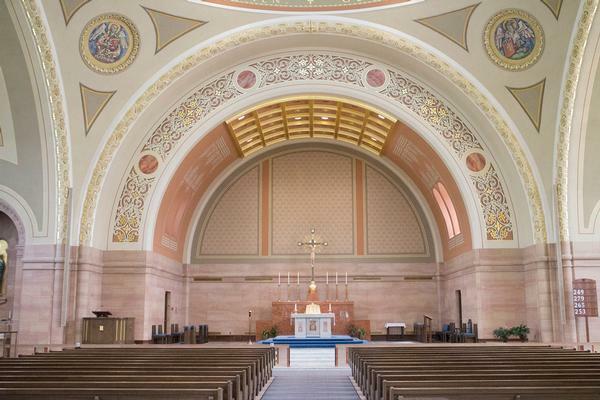 The building was constructed in the late 1950s for a growing parish community. While the surfaces and existing substrate were in adequate condition, the church lacked fitting ornamentatio and decoration. Also, there were signs of age in some areas such as a niche that contained a statue of the Infant of Prague, which had been covered in soot and waxy buildup from years of lighting votive prayer candles. Surface prep for this area and others in similar condition included intensive cleaning before the addition of paint finishes and gilding. The most extensive surface prep was conducted on the lower walls of the nave, where plaster was scored in the manner of grout lines, to further the illusion of the faux marble that was applied. When the sanctuary was built 50 years ago, the original plan included marble blocks covering the walls. However, due to financial concerns, only the walls behind the altar were finished. The rest of the walls were covered in a white vinyl. 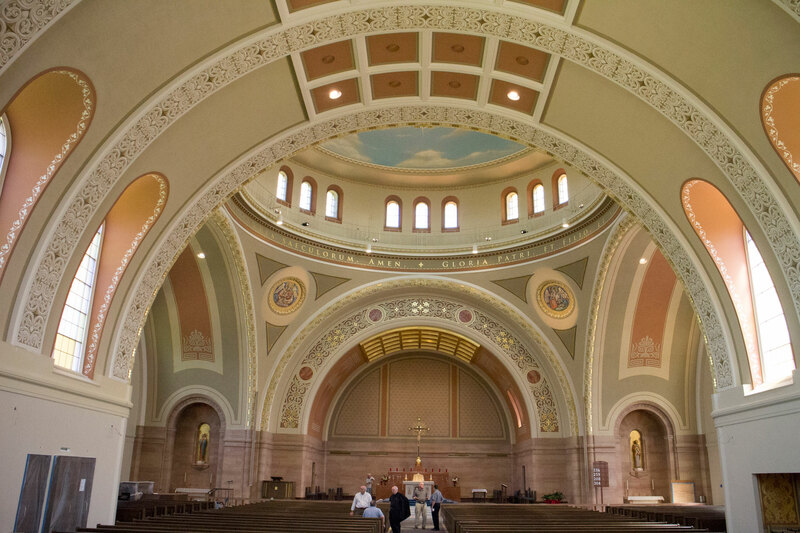 For the recent renovation, the church’s project committee team selected the specific passages from scripture that appear around the base of the dome, and the stencil design applied to the nave arches was based on existing ornamental plaster in the narthex of the church. 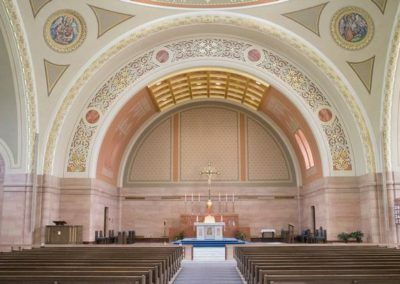 In addition to the committee team’s design considerations, Conrad Schmitt Studios drew from its extensive body of work in ecclesiatic design and tailored trompe l’oeil stencils, to border the mosaics at the pendentives. In order to stay true to their founder’s vision, the committee chose to match the existing marble with a painted faux marble finish. After removing the vinyl wall covering above the wainscoting, artists prepped the surface with a plaster weld and skim coat, into which they carved imitation grout lines. The decorative finish was applied to the resulting blocks in an alternating pattern that alloswed each section to fully dry before its neighbors were taped off. 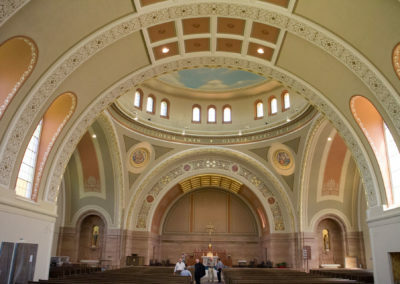 According to local newspaper the Northeaster, “Thanks to the impressive artistry of Conrad Schmitt Studios, however, the walls were redone – not in marble, but in paint. 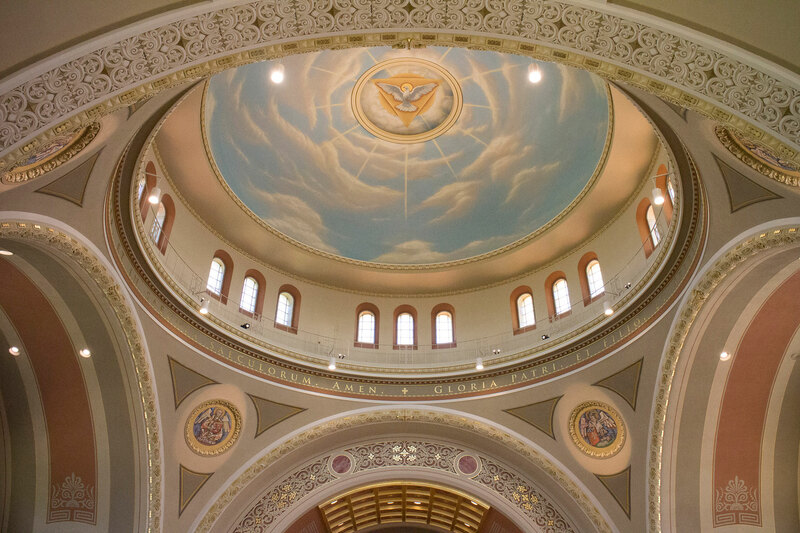 [The Studio] matched the original marble’s color and design so closely that the difference between marble wall and painted wall is indistinguishable.” Other features include an original mural depicting the Holy Spirit descending as a dove in the dome. The figure of the dove alone is 12 feet in diameter. 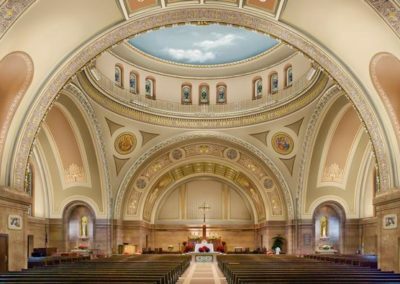 CSS was awarded the commision after numerous design concepts were submitted and adjusted with the representatives of St. Charles Borromeo. CSS supplied several digital renderings of the space, which included many different color schemes, design motifs, and possible mural subjects. Thanks to value engineering throughout the project, the scope of work could be increased without over spending. 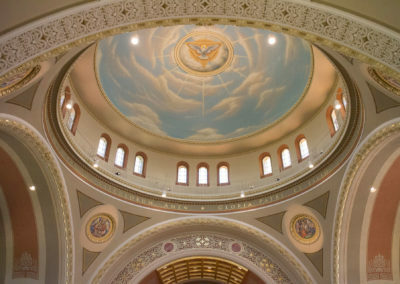 For example, when selecting the treatment to border the dome, Conrad Schmitt artists offered samples of five different gold paints for the committee team’s approval. For cost effectiveness and maximum impact, a less expensive gold paint was used with select areas of genuine 23k gold leaf was used and the two media were integrated to offer outstanding elegance and affordability.